Researchers are studying different kinds of nanoparticles for how well, and how fast, they might deliver drugs and other agents to specific targets in the body. Here, a rabbit carrying a liver tumor with high demand for glucose was treated with titanium dioxide shell nanoparticles covered with glucose. A small area of a thin tissue section was imaged by elemental fluorescence microscopy using X-rays focused to a nanaometer spot. 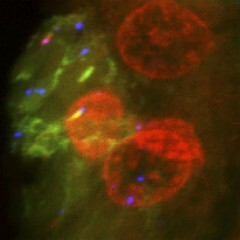 One hour after injection, some of the nanoparticles (aggregates outlined by titanium signal in blue) found their way into cells (cytoplasm outlined by sulfur signal in green) and cell nuclei (nuclear DNA outlined by phosphorus signal in red).